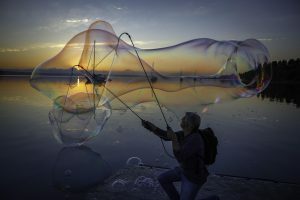 Bright spots in the world often show up in odd places and strange forms. Sometimes, the biggest of those spots fall into our paths at unexpected moments or come from a complete stranger. It’s always a thing of beauty when they reveal themselves in the exact right place and time to flip our entire outlook from stormy to sunny in a split second. Whidbey Island Rocks is a group dedicated to creating those serendipitous moments for locals and visitors. 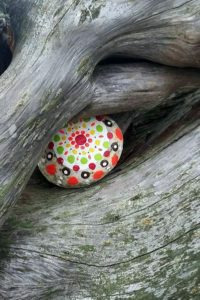 People create, then hide — or at times directly give — lovingly decorated rocks in locations all over the island. Some rocks carry images. Others carry a written message of love or encouragement. Some are created by children, who are developing their artistic ability while others come from the hands of Whidbey Island’s established artists. Regardless of appearance, the result is the same: these rocks are destined to deliver an anonymous hug and a smile to those who find them. 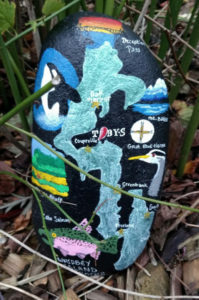 Rock decorators and recipients are connected via a Facebook group managed by Oak Harbor residents Shelly and Scott Darnell. Inspired by a similar group established in Port Angeles, the Darnells didn’t imagine things would grow beyond a small group of their friends and family. “When we set up the Facebook page, I thought it would be a fun way for us to stay connected as a little group. Then I started noticing people that I didn’t even know liking the page and getting involved. It took on a life of its own and grew from there,” Shelly says. Today, the Facebook group has 17,500 members with more people joining daily. Scott and Shelly work hard managing the page as part of their busy family and professional lives. While Shelly was primarily responsible for getting the group started, Scott has moved over to doing more of the heavy lifting to keep things running. Every week, he plans and coordinates events that bring group members face-to-face. Their daughter Bailey, 11, was the catalyst who put the social experiment in motion after she became aware of a similar group that had recently popped up in Port Angeles. “I get a little hyper-excited sometimes, and I was excited to start it,” says Bailey. “You know how moms can be. I had to keep asking her over and over, but finally, she got it done,” she adds. As Bailey shows guests around the family home, her enthusiasm for the rock movement becomes easy to understand. There are multiple framed examples of Bailey’s artwork, and her talents have earned her impressive accolades for her young age. Another thing that becomes evident is how much Bailey loves a good memento. Any item that falls into her field of vision has a unique story attached to it that she expresses with touching detail. To Bailey, each seemingly random artifact is part of her history, and she proves this by explaining its significance with a contagious, effervescent energy. 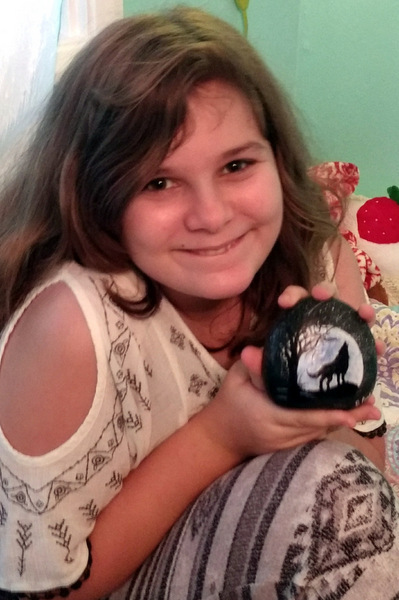 Painting rocks that serve up a smile on impact, and then become part the finder’s history in a tangible form, is right up her alley. A couple on the verge of divorce found a rock while walking the beach. The walk was meant to be a time to discuss their separation, but the rock turned the tide on the conversation and sparked a new mutual interest. A woman found Whidbey Island Rocks as a new mother and lost 20 pounds by hiding and finding rocks (and added a nice outdoor break to her routine). 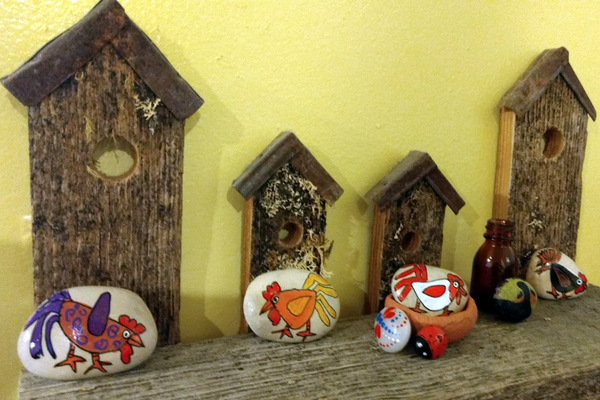 Numerous visitors found a rock by accident, investigated Whidbey Island Rocks, and created their own versions upon returning home. On a more local level, people are enriching their own lives by gaining friends (and artistic confidence) through the group. Coupeville resident Barb Cope exemplifies this. She hadn’t so much as touched a paintbrush when she got involved. A friend added her to the Facebook group when there were fewer than 200 members. 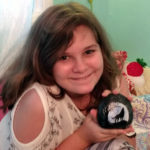 Today, she is a “rock star,” known for dispensing an endless supply of encouragement and support to her fellow group members and also for her rocks, which are emblazoned with her signature image: chickens. She underplays her fame but loves having a personal brand that works in the economy of painted rocks. For Cope, being involved with Whidbey Island Rocks provides serenity and variety when life gets crazy. As much as she loves spending time with her family, tending her garden, and other hobbies, the group gives her a special outlet for connecting with her own thoughts and the world in general. If Whidbey Island Rocks is a family, the family business of bringing happiness in unexpected packages is thriving. Learn more about how to get started here, and watch for rocks as you go through your daily routine. Remember, bright spots come when you least expect them! Wendy Jones cut her professional teeth in print newsrooms, writing for a major metropolitan daily a couple time zones away. After too many years of chasing police cars and defense attorneys (and witnessing horrible examples of human suffering), she shifted into advanced marketing strategy. She is pleased to be writing on Whidbey Island, where she finds her car filled with notepads, index cards, and pens again, just as it should be. Being new to the island, this experience with WIR group helps me meet people and let the islanders know I’m here, as I have my basket weaving studio open to the public! I have come on Whidbey for many years selling my work here, now that live here, this has been a dream of mine since I was 20, now I’m here! WIR has changed my life for the better! I suffer from nerve damage that causes daily pain. 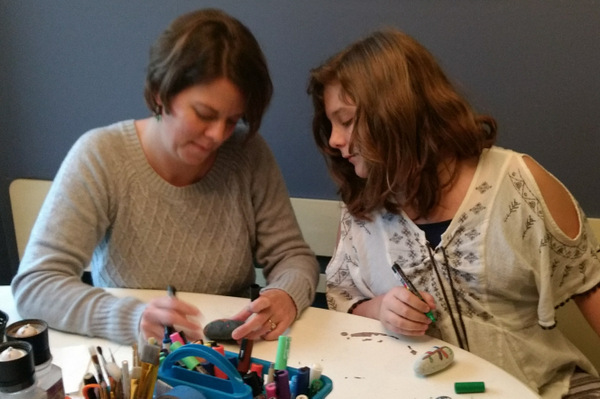 This activity in painting and hiding has helped me in so many ways it’s impossible to list. The people of the group are so supportive of me and each other. I truly love the ripple effect of giving and the smiles it brings. This community is a tight knitted one,but this group has made friendships blossom daily making it even tighter. Thanks for writing this article about it,and sharing with even more who didn’t know about us. I will get back to painting more rocks now! Scott and Shelley Darnell and Bailey too, are my hero’s. And a special thanks to Brandon for keeping the group going! How to I become a WIR painter Very interested in it. Join the Facebook group https://www.facebook.com/groups/WhidbeyIslandRocks/ and they’ll help you get started, Percy.